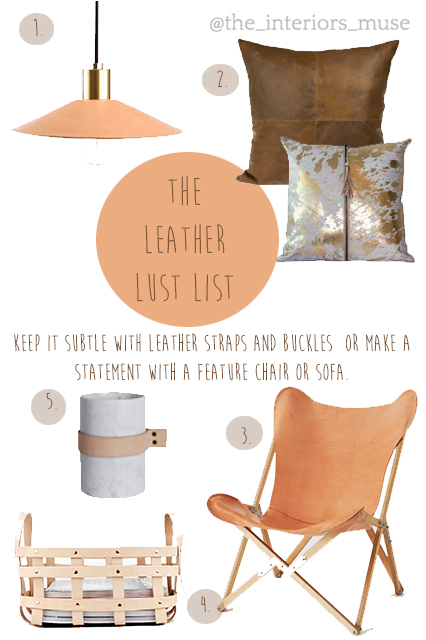 Leather Lust - The Interiors Muse. Good quality leather is always in style but we're noticing hides and leather accents just about everywhere at the moment. You can keep it subtle with leather straps and buckles on your favourite home wares or make a statement with a feature chair or sofa. Light blush and tan leather is beautiful styled with marble and chrome. Worn dark caramel hides are best seen on cushions and chairs that just get better with age. To get the ultimate luxe look and feel forgo the faux.